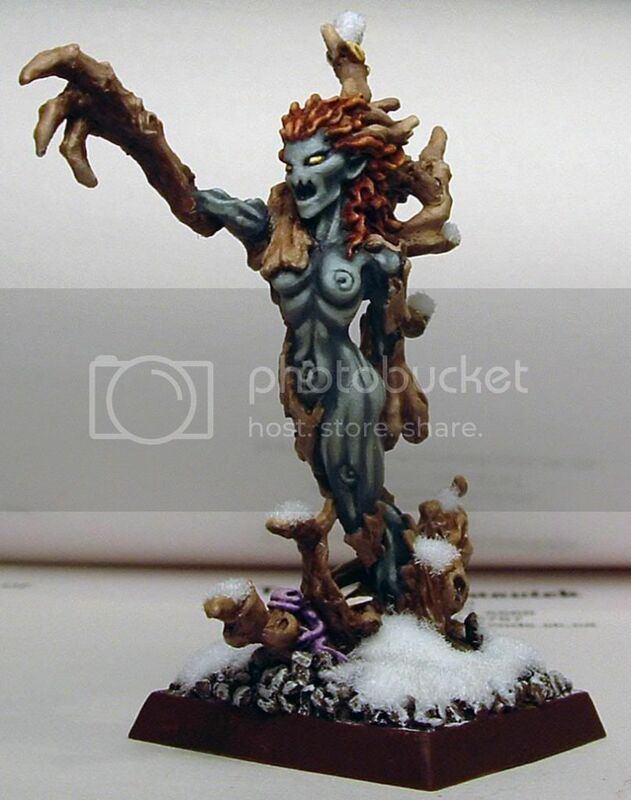 Here are some old pics of some of my Wood Elves. Most of these were painted in 2006-2007, and some this year. The whole army is actually fully painted now. If it is not obvious, I did a winter color scheme with them. 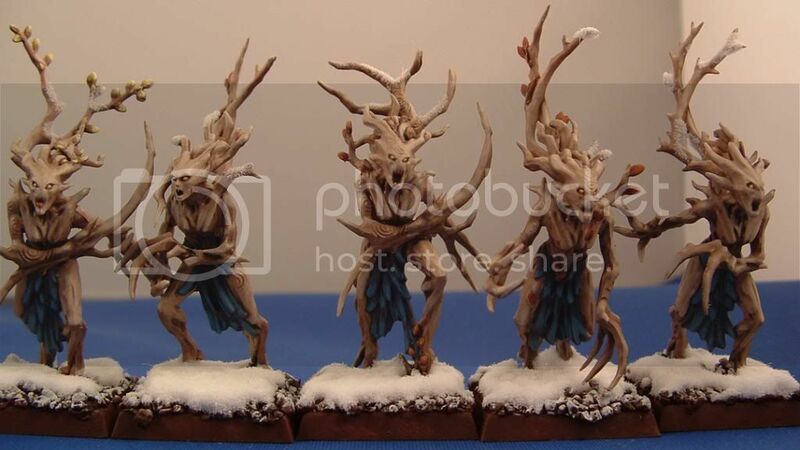 I'm loving these Wood Elves! 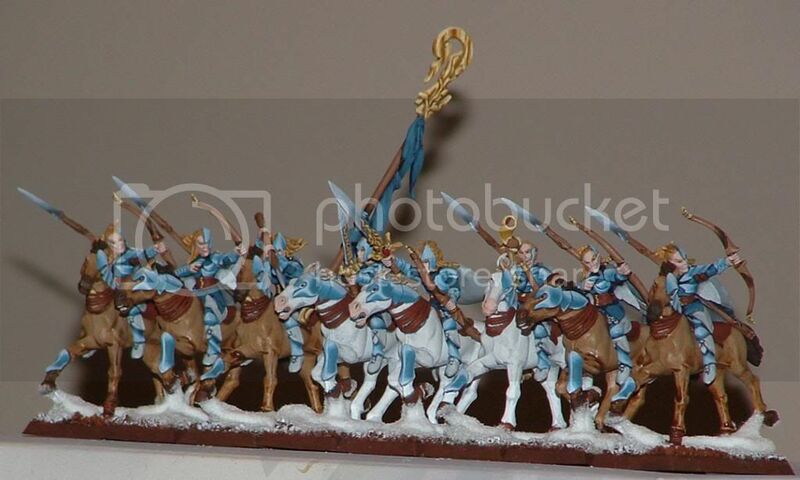 Great color scheme carried throughout the army. The characters really stand out. The glowing effect on the Spell Weaver works really well. My only constructive criticism would be to add more variety in the skin on the horses. The block of white in the center is distracting when looking at the unit. How many points do you have painted? I have about 3500 points painted. Actually those white horses are my Banner bearer, champion and musician, that is why they are all white. That was done on purpose so I could find them easier. At that time I was new to the game, so I was still trying to figure out which model did what. It helped me learn the game. 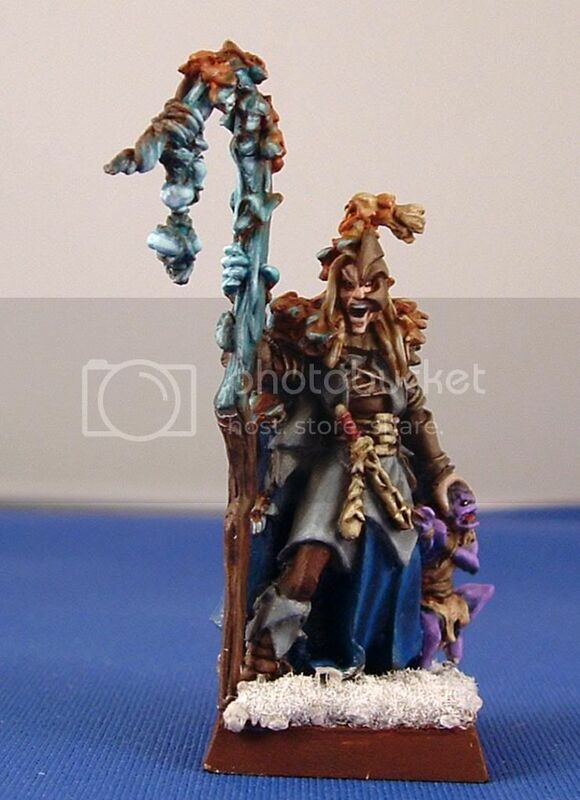 Of course, this was my first army of Warhammer, and first ever painted army, so I was doing a lot of trial and error. That was painted in 2005. Oh forgot I had another couple of pictures hanging around. They are both really poor quality, because I snapped them quick with my phone last month... But here they are anyway... I should take proper pics of these one day. The Snow Owl is really my Forest Dragon. 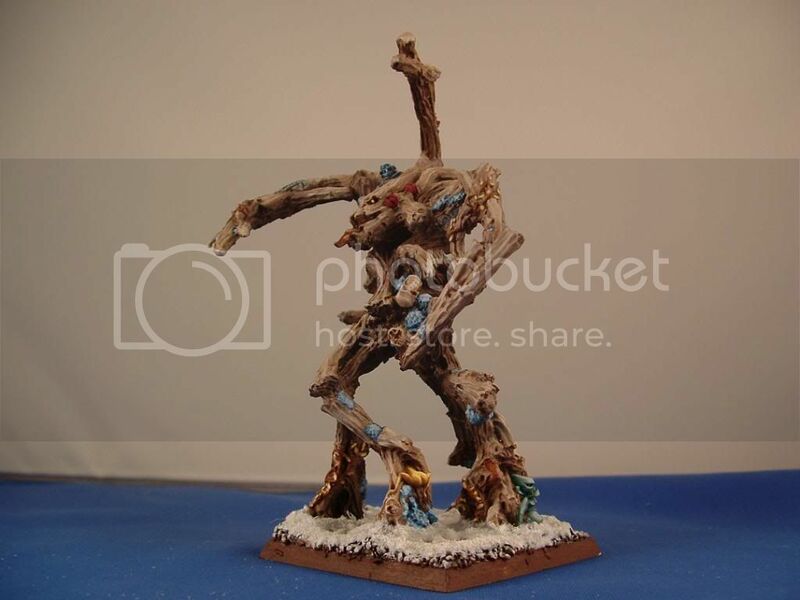 I hate the Forest Dragon sculpt by GW, and I thought a Snow Owl would fit my winter theme better... Instead of poison breath, I tell people the owl is screeching, and the high pitched sound cuts through their armor. The other is a bald eagle, which I use as a BSB on Great Eagle, a Weaver of Great Eagle, or a noble on Great Eagle. 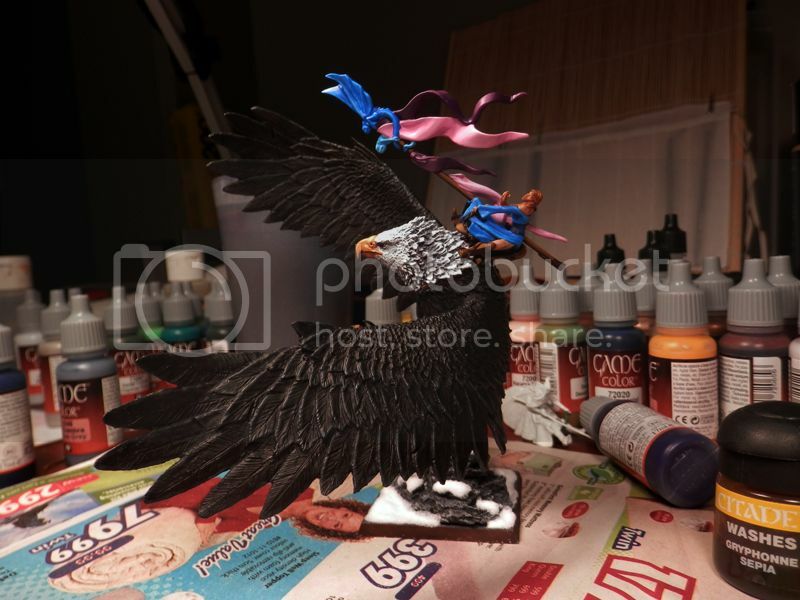 those bird models are really cool. What are they? 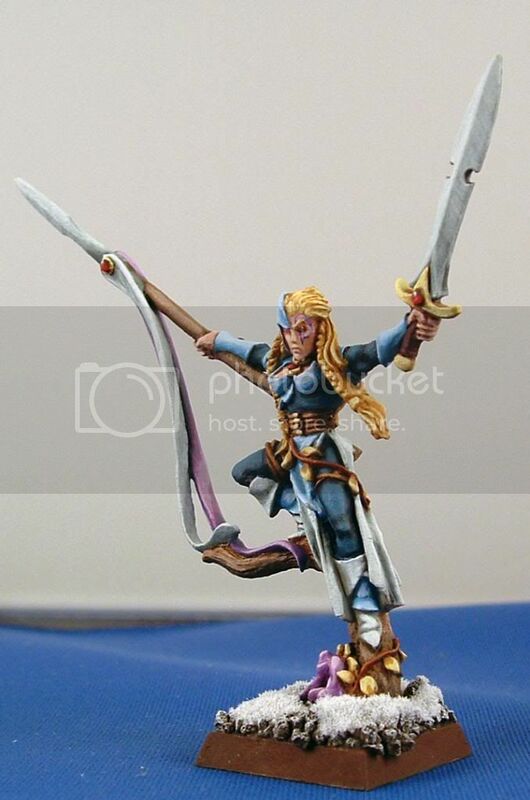 I'm taking a look at those models on CMoN now... they are brilliant! It says they are a combination of metal and resin. Which parts are metal? Were they difficult to build? Have you had problems with them breaking? 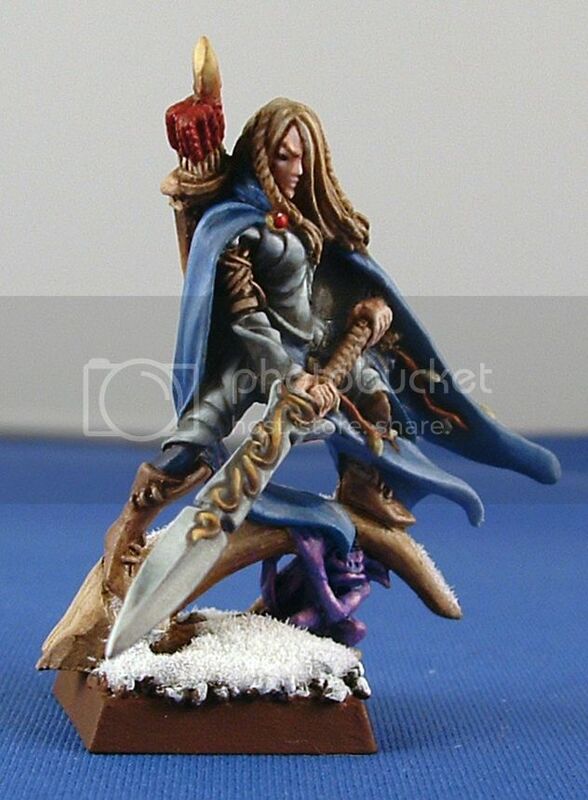 The only metal minis are the elves mounted on top. The birds are all high quality resin. They were easy to build, but I did have to greenstuff one mould area due to a noticeable gap. Once I did that though, it looked perfect. I don't kow if you noticed, not only did I swap the riders, I also changed one of the arms on one, to add a banner, in case I wanted to have a Eagle Riding BSB in the future. 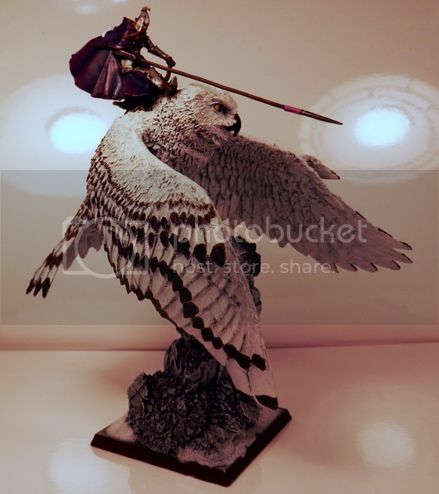 The eagle model is used as a Weaver on Eagle, BSB on Eagle, or even a Noble on Eagle. No breaking, it is not like finecast where you can easily break them. They have some bend or give to them with the wings and they are pretty solid and light. I am using the Owl as a Forest Dragon, and people like it. Instead of the poison breath, I tell them he screeches. Makes just as much sense that a screech would provide a -3 armor save S2 as per the mechanics of the breath weapon.